You may have seen this video during the week, it’s a lovely story of a lady called Joanne Milne (40) who was deaf from birth and her hearing was restored with a cochlear implant. This video shot by her Mum shows the moments when she hears for the first time, in tears as the nurse recalls the days of the week to her. Watching this made me appreciate how much of a difference my ears make to the world I experience everyday. I mean some people (including myself) have recently been talking about the sounds of F1 and how they don’t sound as nice as previously, but imagine that with no sound at all and I think it really puts it into perspective! It is said that if you have shortfalls in one aspect of life then you more than make up for it in another and this is certainly true in this case! I mean think about it, she’s been deaf for her whole life and partially blind also and as soon as she can hear she can start talking! This is the power of lip reading, something she has very clearly mastered over her life and has been able to work out a whole language even though she has never heard it. I bet none of us could go abroad, having never learnt their language and then pick it up just by lip reading! Someone who has been through the same thing is a lady called Kate Locke, who has written a blog as she has gone through the process of getting a cochlear implant. If the video interested you then it is definitely something to check out! She writes very well about what a cochlear implant is and how it works, which I am going to try and briefly summarise here! There are 3 parts to the ear: outer, middle and inner; Joanne’s hearing condition was called sensorineural hearing loss, which is damage to the inner ear. Damage to the outer or middle ear is easier to repair (i.e. perforated ear drum) however the inner ear is the part that sends electrical impulses to the brain which is what makes it harder to heal. Other types of inner ear damage include Presbycusis (old age) and Noise Induced Hearing Loss. Whereas hearing aids work to simply amplify sound, a cochlear implant is different in that attempts to instead mimic the natural hearing system. It first of all captures sound using a small microphone, similar to in a hearing aid, but instead of amplifying it, the sound is converted into a digital code and then into electrical impulses. These impulses then travel down into the ear and are passed through an array of electrodes in the cochlear that stimulate it. Normally, in a functioning ear, there are tiny hair cells in the cochlear, so that when the sound wave causes them to move, an electrical signal is sent to the brain; however in this case the electrodes trigger this instead as these hair cells are either lost or damaged. As an aside, this is why you get a ringing in your ear when loud noises are heard over a prolonged period of time. As sound enters the ear, the hair cells are bent, sending signals to the brain, however when this is prolonged the hairs stay bent causing the brain to think of this as a constant noise. Eventually the hairs return to their natural position, causing the ringing to stop, although repeated exposure will eventually cause lasting damage (i.e. noise induced hearing loss or tinitus). There are many aspects of life where sound is the best part and many others where we just take it for granted. What was your reaction to the video and what sounds would you miss most if you couldn’t hear? As it is currently half term, I have had several family members vising this week, meaning I have been out and about in Salford and Manchester, often visiting places I haven’t been before. 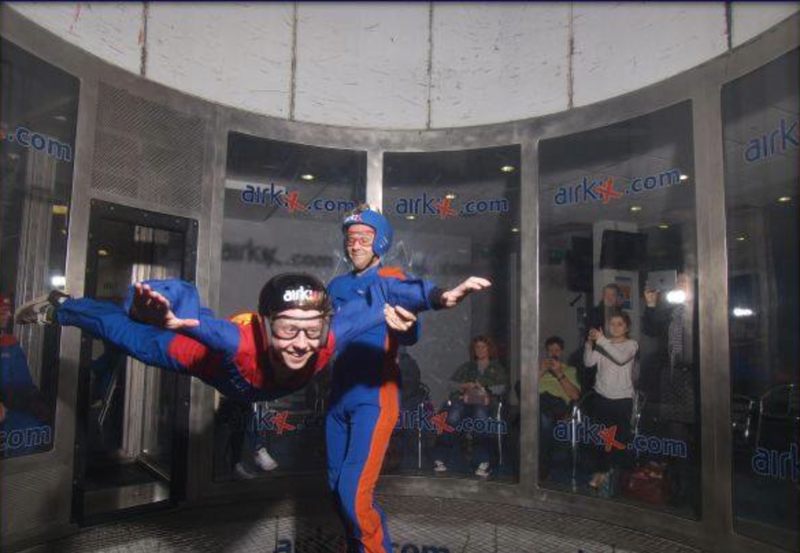 One of these trips out was to Airkix, an indoor skydiving tunnel by the Trafford Centre, where I was lucky enough to be treated to a flight with my uncle and cousin. It was such a surreal experience, falling in a vertical tunnel, yet not moving anywhere, whilst spectators sit around drinking tea and watching you. Despite my clear lack of skill, it is something I would definitely recommend if you ever get the chance. Obviously, when doing activities like this there are many risks involved, hence why we had to fill in forms saying we were fit to partake. Apart from the obvious risks (dislocated shoulders, falling, or crashing into walls) there are other aspects that need to be taken into consideration; the main one of these, which you may have already guessed, is your hearing. I don’t know if you’ve ever been on the phone on a stormy day, but it is often really hard work when all you can hear is the wind, making the conversation very hard. Now this is one thing, but imagine winds of up to 180mph (the speed that this tunnel can reach) and imagine not only how hard it would be to hear, but also the effect from pressure it would have on your ears. Thankfully, before anyone goes into the tunnel, they are given earplugs in order to protect hearing, but do these make any difference? First of all I calculated the sound pressure of 100mph winds (about what it took to lift me) as around 1,200Pa, which when converted straight into decibels, is around 150dB. This initially does look extremely high (the human threshold of pain is around 120dB) even with the earplugs, which have around 30-40dB attenuation; however a few factors need to be taken into account first to understand how this is safe. This pressure is obviously needed to lift a person, but may not necessarily directly relate to sound pressure. There may be a very high pressure at a stationary point in the tunnel, but the ears are covered by the helmet which are also facing outwards, not down, so most of the air goes rushing past. This leads to probably the main principle of acoustics, which is that you need something to vibrate in order to make sound. In the tunnel, if wind is rushing past at around 100mph, which may make a lot of noise due to the fans, the vibrating air particles are flying straight past you so fast that none of them are around enough to cause high Sound pressures. There is also quite a distance from fans to receiver and the way these fans work is shown on the Airkix website. The duration of the flights are only 1 minute long (around 15 seconds longer than the free-fall when parachuting) which shouldn’t increase the Leq (the equivalent noise level if played constantly over a given time) excessively based on the whole duration of the visit to the centre. This is often why parachutists may wear earplugs for the noisy and longer plane journey up, but not for the flight down. One final major factor could be the psychoacoustics of the noise, being the sound of wind, which is familiar meaning the flier feels less threatened and can be perceived as less. This could be linked to the frequency distribution of wind, which may be such that it does not affect the human ear so much. There are also likely psychoacoustic effects of giving out earplugs, whether they make much difference or not. What do you think? Have you ever been skydiving or experienced high winds and noticed any effects on your hearing? A blog about my experience of being deaf and getting a cochlear implant.